It is surprising that in these many years of writing astrological profiles of well-known people that I have never focused on William Butler Yeats, arguably the greatest poet of the twentieth century. Other poets have had important and distinguished bodies of work, notably T. S. Eliot, yet nobody rivals Yeats in continual popularity from his lifetime to the present day. 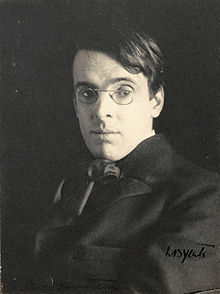 Like some other great poets over the centuries, Yeats also defined himself as a public figure: he sponsored and promoted the literary arts of his native Ireland; he was an Irish nationalist and was a member of the Irish Parliament in the years following Ireland’s independence from England. Yet he was far from a just a national poet for Ireland, for his interests and work was international and world-historical in scope. He won the Nobel Prize for Literature in 1923. 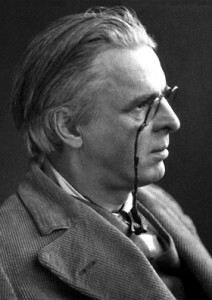 Yeats was also interested in western magic and theosophy, being a member of the Theosophical Society and later a prominent member of the Golden Dawn movement, in which context he studied astrology and wrote about its symbolism. Yeats’ poetry is wide-ranging, from the mythical to prophetic to sensual and he was a master of rhythm and sound. In fact, for many people who do not understand his poetry, they love how it sounds and feels. His most frequently anthologized and quoted poem is the prophetic “The Second Coming” followed by the mythical-historical “Leda and the Swan”, the ironically heroic “Easter 1916”, the pastoral and nostalgic “The Lake Isle of Innesfree”, and the valedictorian “Under Ben Bulben.” Another famous later poem, “Dialogue of Self and Soul” is the basis for my upcoming presentation (July 2014). Yeats’ work has had its detractors as well. Although universally acknowledged as a brilliant technical and highly articulate poet, much of his poetry flows from himself at center stage and has been considered highly theatrical displays of himself. (Note in the newsletter from April that the poetic work of W. H. Auden was a deliberate antithesis to Yeats’ perceived self-absorption. I will let others more refined than I sort this one out. For more information about his astrological symbolism and his love-life (that I will also mention below), please see this excellent article by Sarah Fuhro written in 2002. She emphasized Yeats’ associations with the magical traditions of his time, and it is a very good read. Now let’s examine his chart (click the chart to view a larger image in a new window), truly a beauty to behold. Although as a poet we are quite interested in his Mercury and Venus placements, let’s start as normal with the Ascendant and matters related. Yeats has Aquarius rising and has Moon in his First House, and this will tell us much about him. Aquarius is a fixed air sign and is governed by Saturn (not Uranus!). Traditionally Aquarius was also called a “human” sign and would bestow good looks, an affable manner, and sense of social or cultural context. All true, but it’s hard to imagine Yeats not being passionate, driven, and intense. Yet Aquarius helps give him a cerebral and contemplative quality that is captured well in his poetry. Saturn in Libra in the 9th governs his Ascendant and is dispositor for his Moon. 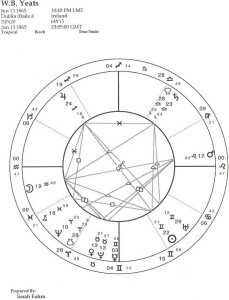 Although out of sect in his nocturnal chart (Sun below the horizon), Saturn loves being in Libra where it is exalted and it would help his discipline and focus as well as showing his interest in tradition and precedent – but according to his own understanding. What does the Moon in the First contribute? The Moon is the planet of adaptation and visceral understanding (otherwise known as “sensitivity”) and would have a strong role in the emotional appeal of much of his writing as well as the musicality of his verse. No modern poet sounds better than Yeats. The Moon’s next application to a visible planet can show us what chart factors have a special emphasis. Shortly after Yeats was born, the Moon will aspect by trine both Saturn in Libra and Sun in Gemini! (Sun will have moved to 23° Gemini and in an exact trine with Saturn by the time of the aspect.) One could call this a “grand trine in air” but to me that seems more static and less dynamic than considering this powerful application of the Moon. Note also that Moon is in one of Saturn’s signs and its applying to Saturn is an example of “reception” – Saturn receives Moon and powerfully contributes to the Moon’s nature. Clearly Yeats was gifted from the outset and his chart as a whole shows us much of this. However one’s native gifts must be supplemented by the application of hard work over a long time. No composer worked harder than the prodigy Mozart and no poet worked harder than Yeats to develop his gifts to the highest degree possible. Finally we arrive at Gemini placements in his chart. How do we understand this mutable airy sign governed by Mercury? In general, the air signs are all concerned with multiplicity: Libra’s contribution is the note polarities and to harmonize them and that of Aquarius is to find some overarching principle by which to restore unity. With Saturn in Libra and with Ascendant and Moon in Aquarius, all these means are at his poetic disposal. Gemini’s contribution, however, is not only to expose multiplicity but allow them to exist side-by-side, to revel in variety and open-endness. In that way Gemini makes itself available to new experiences and tentative ideas soon to be replaced by other possibilities. In fact, Gemini will even accentuate differences without forming conclusions – and this is what is accomplished by Yeats’ later poetry. We begin with Sun in Gemini, of course. Aside from the focus and discipline of Saturn, the Sun tells about his sense of who he is, and would contribute to the subjective and personal thoughts, feelings, and events that are so prominent in his poetical work. Note the opposition by a Jupiter in its own sign Sagittarius and in its house joy in the 11th. a placement of certainty and love for the overarching vision. In spite of the opposition to the Sun, Jupiter’s role is wholly constructive – note the harmonious sextiles between the Moon governed by Saturn and by Saturn itself. Yeats was a visionary poet who never settled on a vision. The desire for unity remained an important ingredient in his work, yet this desire was never fulfilled, for Yeats sometimes went into the direction of ideology but never dwelt there – my guess is that his creative instincts abhorred a closed system that would have been the result. For Yeats Gemini always has the last word. The difference is Mercury in Gemini that is oriental and conjunct the Lot of Fortune by degree. The diurnal-version of Mercury is in charge of Gemini, of course, and Mercury’s conjunction with Fortuna is further evidence of that planet’s central importance. Additionally, his Lot of Spirit is in late Virgo and is also governed by Mercury! Although Yeats’ verse is orderly and systematic within each poem, the variety of his output is utterly dizzying; one might need to look back to Shakespeare to find somebody who could do this better. Note Yeats’ Midheaven degree. This should not be confused with the 10th house or place of career that is always the tenth zodiacal sign from that of the Ascendant. Yeats’ Midheaven degree falls in the 11th house, in the same sign as its dispositor Jupiter, and is directly opposite Mercury. What does the Midheaven degree mean if it is not the cusp of the 10th house? On this matter I tend to take a page from the Cosmobiology folks (see below) who look at the Midheaven as conscious awareness, “the soul” and there’s some overlap with the Sun’s symbolism. The Midheaven degree is the intersection between the zodiac and the local meridian, and, through the Sun’s distance from the meridian, related to the cycle of day and night for a given location. I approach the Midheaven degree as an index of lifestyle, interest areas, ones individual approach to the larger world – not just what you do for career. Mercury opposite Midheaven degree is another indication of Mercury’s prominence and its role in all his endeavors. Given the vicissitudes of his love life, it’s hard not to note Mars in Leo in the 7th house of relationships and its squares to an exact Venus-Pluto combination. Yes his long-term love for Maud Gunn was not without theatricality, in spite of a happy later marriage and many affairs in his later years; all of these factors fueled his poetry. I will leave the details of all this to the interested reader and there is much available to read about his creative love-life (See Sarah Fuhro’s article cited above). The fixed signs involved give steadiness; Pluto and Mars together with Venus give intensity of desire, a strong sexual nature, and no small sense of fate’s strong involvement with love and sexuality. 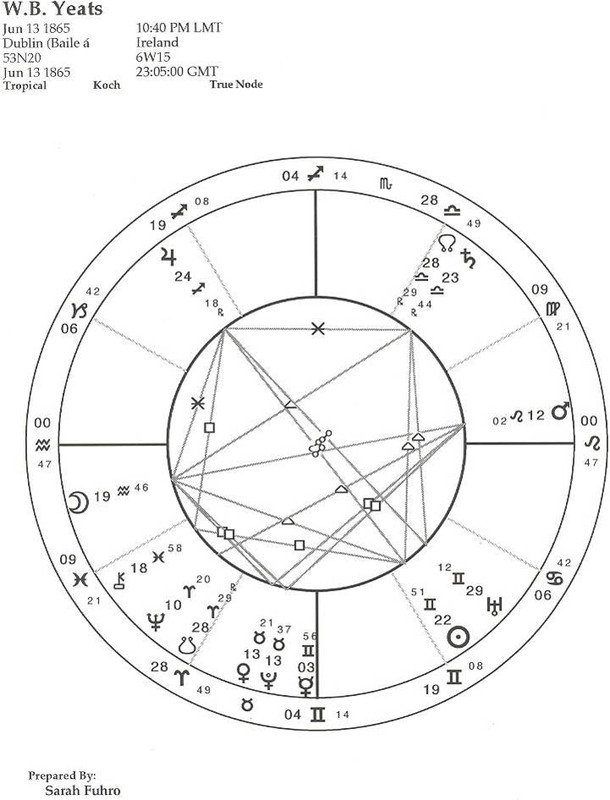 Using modern midpoint practice, one sees this also in Yeats’ chart: Sun=Venus/Mars and Mars/Pluto. Issues of identity and life purpose are strongly involved with Venus, Mars, and Pluto. My source is Reinhold Ebertin’s Combination of Stellar Influences a book that is surprisingly well-thumbed for a traditional astrologer like me. So what does Ebertin say? The basic principle of the Venus-Mars combination is “The impulse to love. Passion.” No surprise here. If Sun is the midpoint between these two, “A strongly physical love, artistic power of creation. The urge to establish a union between the sexes, marriage, procreation.” And Venus/Pluto: its basic principle is “Fanatical love, the desire for sexual pleasure, lasciviousness” and with the Sun we get “Great creativity, an unusual sense of form, deep affection. A peculiar destiny in love.” Turning traditional we can also note the angularity of Mars and Venus/Pluto, Venus being in its own house in Taurus and Mars disposited by his Gemini Sun. If we combine this intense passionate nature with a powerful sense of life’s multiplicities and a concern with the larger issues of life, we get William Bulter Yeats. His natal chart very clearly shows us these factors.